The coin validator from microcoin, main feature is versatility by it's many programming options. Allowing it to be fully tailored to meet the operators requirements. The basic operation of the S6 is each time a coin is inserted it compares it to a stored set of values in it's memory. It accepts or rejects the coin based on this analysis. In order for the mech to accept a new/different coin, that is not in the memory, it needs to be programmed to accept this new coin. This is done via a programmer (sold separately). The coin validator from microcoin, main feature is versatility by it's many programming options. Allowing it to be fully tailored to meet the operators requirements. 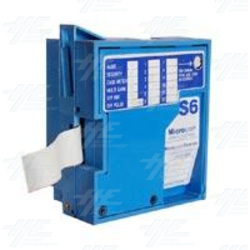 The basic operation of the S6 is each time a coin is inserted it compares it to a stored set of values in it's memory. It accepts or rejects the coin based on this analysis. In order for the mech to accept a new/different coin, that is not in the memory, it needs to be programmed to accept this new coin. This is done via a programmer (sold separately).